British train robber Ronald Biggs made Rio de Janeiro famous as a hideaway in the 1970s. To support himself and his family, he used to hold barbecues for tourists, at his Santa Teresa home. Nowadays foreigners arrive in droves, armed with their own money to invest. They also have ideas and business experience. And they aren’t so much into backyard barbecue as tapas, burritos, diner fare, or gelato— novidades for many locals. Yet Rio feeds all kinds of appetites. RioRealblog’s first profiled foreigner bearing carioca dreams is more hungry for rhythm and melody, than for food. Born in Sarajevo, raised partly in Kuwait, Devla Imperatrix (her real middle name, honoring the Karl Orff opera Carmen Burana) speaks no less than eight languages. After years of dancing and teaching flamenco in Europe, Devla came to Rio with samba in mind. To her surprise, a samba school existed by the name Imperatriz Leopoldinense, or Leopoldian Empress. Devla had no doubt her destiny lay in the North Zone Ramos neighborhood. On the samba school’s dance floor last year, a director chewed out the 5-foot-ten-inch beauty for wearing flats. “A passista (official samba school dancer) has to wear heels,” he warned. Devla wasn’t a passista— yet. 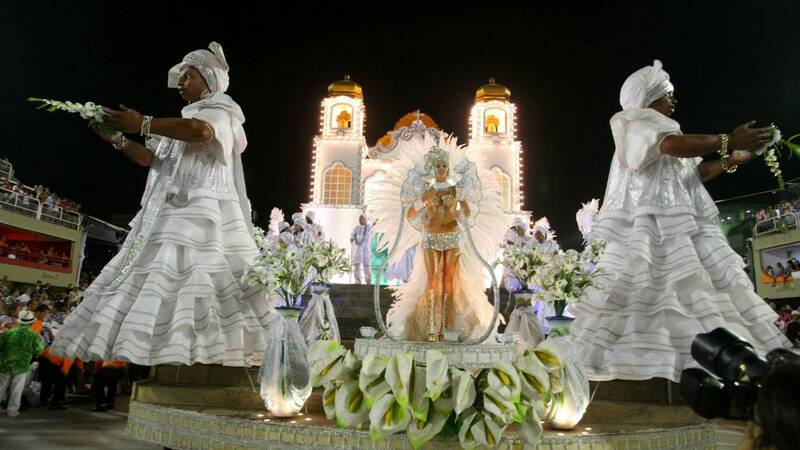 After lessons from famed teacher Carlinhos de Jesus, she won a spot on an Imperatriz float in this year’s Carnival parade. The parade was no slice of cake. Devla’s dress was ready only 45 minutes before the samba school began moving down the avenue. Her skirt came unpinned; experienced dancer and performer that she is, Devla focused on moving her arms, transmitting the magic of samba with what she calls “a contained presence”, until she could fix it. One dream ticked off her list, Devla now aspires to create and perform a fusion of gypsy dancing and samba. She also wouldn’t mind a role in a Globo novela… and meanwhile, she’s using her business degree and savvy at Global Vision Visas, specializing in customized immigration solutions for multinational oil and gas companies. This entry was posted in Brazil, Transformation of Rio de Janeiro / Transformação do Rio de Janeiro and tagged Carlinhos de Jesus, Devla Imperatrix, Elymar Santos, Imperatriz Leopoldense, Rio de Janeiro carnival, Rio de Janeiro entrepreneurship, Ronald Biggs. Bookmark the permalink.